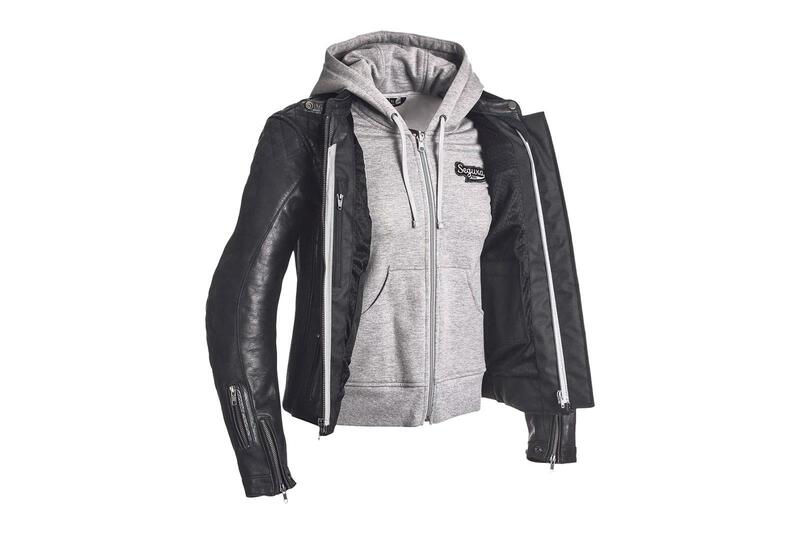 I absolutely love the style of this cowhide leather jacket and built-in hoodie – especially the diamond stitch on the shoulders. It’s CE approved and has a removable hoodie-style lining, which is the best part of this purchase. The jacket feels well made – nothing has gone wrong so far – and is super comfortable and soft inside and out. The jacket is windproof and although I wear an external back protector, it has a pocket to insert one. The Segura jacket is perfect for a British summer, when the weather is not that hot you really do keep warm. Plus, when you park up, you can whip the jacket off and hang out in the hoodie, which can be worn separately. It’s also available in a men’s cut at the same price. The price isn’t for the faint-hearted and it doesn’t come with a back protector, only shoulder and elbow protectors. The outside pockets are quite small and don’t fit much in. I recommend buying a size up as this is a bit snug for my usual UK size 8 figure. And although I can easily fit my gloves over the sleeves, it’s a bit tight to zip them underneath. I don’t even bother anymore. The jacket is not waterproof, but you can purchase a leather waterproof spray for £7.99.